The current status of my palms up front right before the cold snap on thanksgiving. Chamaerops fully defoliated and pulled on 2 trunks but put out seed in April. Livistona fully defoliated as expected and the cerifera got sick on some potting soil but bounced back in the ground but is slow as molasses. Will be updating as fall and winter progress. Thanks! Hoping this winter doesnt get as bad as I think it will. No matter what I have spring and the best microclimate to plant and mess around in. Thanks! Just an easy way to document my what works and what doesn't work. I love when Palmtalk members make video updates. I will stay tuned! The low here in southeast Georgia was about a 41last week. We usually don’t start dipping into the 20’s until January. Hopefully this winter won’t be like the last one. Im hoping for the same! But so far we have been well ahead of schedule for cold and have already seen a good mess of winter weather already. I'm not worried so much about the precipitation, but could do without the extreme cold of last winter. We're looking at most likely our first freeze here in the great Cola area. Calling for 28 I think. Hit 34 this morning. Then next week all in the 40's for lows. 1/4 of the lows are bellow freezing in the 10 day forecast rest are near mid 30s to mid 40s. 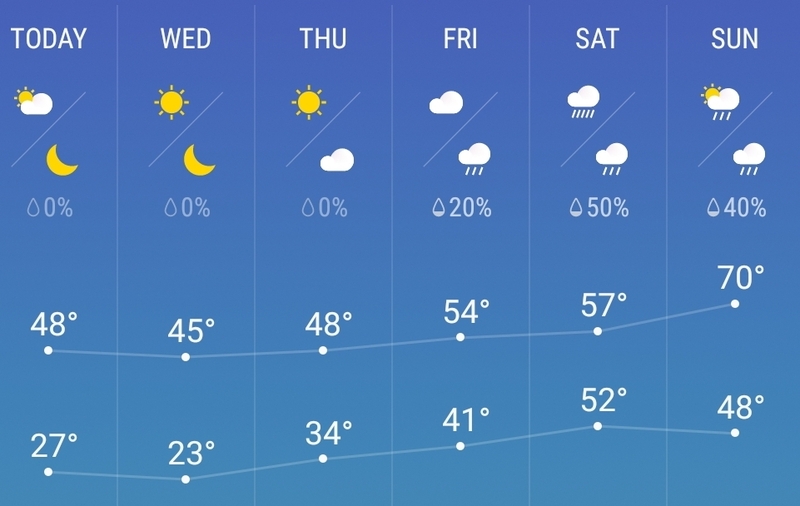 November through March is a damn rollercoaster. Saturday to Sunday will have a 20f difference...such is life in the DMV. Looks like we are getting a break from the cold (freezing) soon here (for a while), so far 23 has been the lowest low. All I want for Christmas is an 8a winter. All I want for Christmas is a winter that is average lol. Today and tomorrow's temperatures are going to be around 15º below average for late November. My palms would love an 8b/9a winter that we may get every couple of years. Ours is looking quite similar here. Sounds like early October to now...always 10 to 20f or more bellow average. Super early first frost....record shattering snow. I'd love normal winters again too lol. We definitely had an early first here, October 22nd. Normally we have it in early November (I believe we had it November 4th last year). But, we were in the "danger zone." Most Halloweens in the past I remeber (before I was a plant and palm addict) my neighbors banana trees still being completely fine. Mine actually grew a leaf or two each trunk before a killing frost came (which was in early November). The only cool thing about the frost we had first, which was a light frost, is that it helped me find the best microclimates in my yard. Luckily I have my garden beds in one of those good microclimates! The phone loves to auto correct what I ment to say. Our first frost is usually in early November as well. Usually bananas last well into November around here til folks cut them down due to winds tattering the leaves. This year we had a super early frost (light) followed by WELL bellow average temps so by late October early November the bananas looked pretty rough but still technically were OK. But folks around here are picky and just hack and mulch for spring. I'm really jealous about your placement as I sadly went for looks and prime showcasing over microclimate as I wasn't familiar with my land when I started. I'm thoroughly convinced I will have little to no trouble in my best microclimate, whereas the current spot will likely be an issue from time to time. Starting to consider cutting bait on this side and digging up some of my palms to move elsewhere. But I'd like to keep some over there like needles and minors (when I get some). Put a temp sensor and see how much colder it gets in that spot. I hope it hangs on long enough to recover in the spring. We’ve had a ton of rain lately (not sure about MD), over 10 inches in the last 30 days. Not so good heading into winter, especially since it’s been cooler than normal. I just checked my spears, all firm (for now), but today’s rains may be the last I let my palms see until the spring. I lost both of my Majesty palms and my Washingtonia (all spear pull) this spring from cool rains. As I showed in the video there are 5 kinds of palms and a cycad within 6ft of this area. I also had 2 sensors last winter across this section of garden and it showed no variation. the idea behind havign 2 sensors was to make sure the temperature was even across then entire enclosure during last winters events and I just never moved them when I opened up the enclosure for the rest of winter. I do too as it hasnt been anywhere near cold enough to defoliate a Livistona chinensis let alone kill a rhapidophyllum hystrix! I hope this area of my garden isn't cursed as this will be the 2nd plant I have planted that has gone bad in this very spot. I cleaned out the hole best i could and the palm seemed to be happy until recently. As for rain we have seen well above average precipitation all year and I have debated putting a canopy over the palms nearer the end of December or early January. But this year I'm testing the limits and haven't even put any protection up yet and don't plan to unless with have a bad event come like last year. These palms have 2 growing seasons under their belt and while they are still marginal here I'm going to push them a bit this winter and hope for the best. Ill admit that I have debated digging up the trachycarpus and chamaerops and moving them after winter, but I'm just not sure I want to disturb them and have to go through another teething process of settling after transplanting. Ill be totally fine I think if the rain doesn't get too out of hand and the temps stay close to average and don't dip into the single digits. But I fear with how things are already shaping up that we are in for another winter like last winter just with more precipitation. If that's the case Ill 100% put a canopy over them to keep the rain out. Looks like a lot of cold nights this week for everyone. It may go into the upper 20s here (low-mid 20s at the airport) and then after that back into the 40s. At least this week is sunny but cold at night. Daaang it! A picture of the garden today. This week is supposed to be dry but chilly.If the wet pattern comes back I would definitely use a canopy. Yeah lows in the mid to upper 20s and highs at 35 to 45...would be bellow averages for January for the high.... my palms are still looking goo save for the one needle. As usual your palms are looking good! After this, we should see warmer temps until late December. Last year the low for Dec and Jan was 30F not this year. Thanks for noticing the palms, that tall buddleia in the background is getting a big haircut this week. It is 15' tall. This is the month to do it. Since mid-January, it will start to produce new leaf buds. Good luck and hopefully not to bad for the east coast. I've been told by a few friends that I live in a microclimate. Airport last night 31F my neighborhood in town, 40F. Lucky you! I too have a situation like that about 8 or so minutes away to the east, west, north, northeast and southwest where they are typically lower. I think this guy will live. Rot in spear area didn't go to deep. I sure hope you're right! Keep up the good work! I really enjoy seeing updates from my old home town area. I remember my struggles and failures up there vividly. I think my biggest success there was in Del Ray, Alexandria VA, where I planted a fairly large Sabal Mino on the front side of the house I lived in there, that faces south. Two years ago before I left for Florida, I went back and looked and it was still there, looking great, and had set seed twice from what I could see. We are even feeling these cold snaps down here. The cold has started early this year. Last year it did not really start until later in the winter for us down here. Im in a zone 10A now, and last week we had two days where the high temps were 54 & 57F. The lows those nights were 48 & 50 respectively. The average high this time of year here is 75F. Average lows are 58F. Those two days our average highs were lower than our average lows. Its been a rollercoaster here for a month now. 3-5 days with mid 70s to 80s, followed by a strong cold front that knocks us back to the upper 50s to low 60s for highs. Even key west saw lows that were 59-61F. Thats COLD for that far south. Its funny how we adjust. When I moved here I laughed at people wearing coats and what not at 60F. Now, I'm one of them. LOL! I used to break out the shorts when it hit 55 back home in DC! Anyway good luck with them and please keep us updated! Looking at long range forecasts/models, don't see any big freeze events on the horizon for FL through much of the rest of December. May be until January before that threat comes. I sure hope it's not like last winter. Checked on the palms today and every spear is intact save for the one that pulled due to a fungal deal it seems. Will be showing the progress of everything soon enough and will show the damage to sagos and the start of my livistona chinensis decline. Honestly I could take a few degrees bellow average, but single digits can be skipped this year since we have had more than our share of them for many years last winter alone! Usually bellow 10F is RARE here but since 2012 ish we have have quite a few with 90%+ being in January 2018 alone... Essentially I'd take a handful of average winters for a change so my palms can get established and be hardy enough to not worry. Latest update after ZERO protection and the polar incursion. Got to 3.1F briefly and have had some spear pull on young needles that are still strap leaf, both chamaerops mostly spear pulled and even had a trachycarpus pull. Things are looking pretty grim right now and I don't expect anything to live after January weather for nearly 3 months. Hopefully the outlook is mild for the remainder. I have been treating the palms with H2O2 a few times the past few days in hopes to stem any fungal issues. I'm hopeful that these palms will make a recovery, but I'm pretty sure most will not make it back and the larger sagos are pretty much toast while the smaller ones still retain a slight green for now. Not sure if I will risk transplanting these palms, but if they make it in the spring it will be a true testament to their genetics and might sway my decision. Only palms Id ever consider moving are the trachycarpus and the chamaerops. Honestly Im more surprised than ever that these palms and cycads have done so well in my worst microclimate in zone 7A. Here is a video the morning after the polar incursion. Did you not protect because you are moving? Lots of palms to lose there but hopefully some will recover as this cold spell could have been much worse. Not moving just wanted to test the palms as that side of the garden will have a "remodel" soon enough and I'm moving my zone pushing to the spot thay I originally wanted my palms to be now that the wife is happy and has no more addition plans for the next 30 years. Reckless it is, but we didnt have weather that even phased the sagos til late January and I figured why not see how these plants do in the worse placement. Will post a video here soon comparing the palms in late May 2017 to November 2018 and the difference is astonishing given what they went through in 2017/2018 winter and if they grow that well there then my full sun microclimate, a whole mess of knowledge I have obtained and better practices in care should yield good growth. As for this last cold spell we hit the same low as last winter which is super rare but is about as bottomed out as we can get save for 1899 or late 80s spells aka century events. I will see on march and will certainly share the results. FYI - I've had zero issues moving needles. They act as if nothing happened. Don't plan on moving or protecting the needles or future sabal minors. Would be adding a mess of both kinds to that garden to replace what dies or gets moved. Will do a waggie in the corner where the livistona clump is (digging this up soon as it sprouts) and lots more yuccas....as many yuccas as I can get. Don't know if you've ever tried it but snow is a great insulator. If there's snow on the ground and you know you'll be getting extremely cold and/or windy conditions pile the snow (gently) on the plants you want to give a little extra protection. They'll be warmer under the snow during overnight lows, the foliage doesn't get wind burned, and the ground won't freeze as deep or get as cold if/when it freezes. I did it with all kinds of plants when I lived up North.